Guo Xi (Wade-Giles romanization Kuo Hsi), like fellow Chinese artist Yi Yuanji lived during the Song Dynasty. He was born around 1020 and died around 1090. Xi lived in the Henan Province and is remembered not only for his paintings but for The Lofty Message of Forest and Streams, a book in which he discusses what he considers the proper way to paint an landscape. He was a student of Song Di. Xi was a highly educated, court professional who worked in the academy of Emperor Shenzong. Shenzong lived for only 36 years, ruling for half of them, and is most remembered for his reforms designed to improve the lives of the peasantry and unemployed. Many of Xi's works are believed to help promote this spirit of harmony and were viewed as political works by Shenzong's successor Emperor Huizong, a painter in his own right. 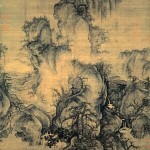 Guo Xi's brushstroke techniques were employed by later painters. 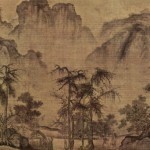 He refused to subscribe to the preconceived notion that paintings should represent a scene from only one view or perspective by creating what he called his “angle of totality.” The Angle of Totality is also referred to as “Floating Perspective” which highlights the differing views between Chinese and Western techniques for spatial representation. He insisted that while mountains are 'constant beings' their appearance changes as the viewer does not remain in a fixed position and therefore paintings of mountains should not depict mountains as fixed. Xi, used multiple layers of ink to create softer blended areas in his paintings; some have as many as 7 or 8 layers. He is perhaps most well-remembered for his depictions of trees. Often leaf-less in winter, his trees provide further meaning to his works. Vertical trees represented individuals who were informed and flourishing, bent trees were seen as keeping information to one's self and gnarled trees with claw-like branch tips represented individuals who were clinging to their own virtues. This styling was later employed by Ca Zhibo in Two Pine Trees (1329), which at least one scholar believes was used to depict the unfavorable treatment of Confucian scholars during the Yuan dynasty. Xi fell in and out of favor with successive emperors. Writings remain from his son, Guo Si, who often campaigned for favor for his father's work and his theories on spatial representation and painting mountains. Folklore surrounding Xi has him being so out of favor at times that a number of his paintings were used as cleaning rags.